We take a look at the latest trading update from Food Producer AVI (AVI). And for the producer of Five roses tea and salticrax the trading update was not a good one. And the market is punishing its shares heavily. The below is the trading update as released by AVI on SENS. And its no surprise that the market is punishing the shares. Headline earnings are expected to be between 6% and 7% lower than the year before. This is not what investors wants to hear. EVER. Comparisons to prior year results in the commentary are made on a like-for-like basis, before taking reclassifications in terms of the new revenue and lease accounting standards, which were adopted with effect from 1 July 2018, into account. Group revenue for the semester was 0.2% higher than for the same period last year. The trading environment remained difficult with continued pressure on consumer spending resulting in sales volume weakness in many of our businesses and was exacerbated by competitor discounting in some categories. In particular December’s sales volumes were lower than last year including in Spitz which was unable to repeat last year’s record December sales volumes. Selling prices were increased in selected categories where there was a need to ameliorate accumulated cost pressures, but were maintained throughout the period for the most part. Gross profit margins were well protected reflecting generally low raw material cost inflation and good cost control. Despite tight management of selling and administrative costs, operating profit was lower than for the first semester of last financial year mainly due to the impact of the lower volumes. Cash flows remained strong through the semester. In addition, the semester’s results were impacted by provisions for the significant restructuring at Green Cross, and an unfavourable movement in the mark-to-market adjustment on I&J’s fuel hedges resulting from the low oil price at the end of the period. The impact of the new revenue and lease accounting standards, adopted with effect from 1 July 2018, on headline earnings for the period was negligible. The weighted average number of shares in issue during the period was 0,6% higher than in the same period last year due to the issue of new shares in terms of the Group’s various share incentive schemes, including the black staff empowerment share scheme. – Consolidated earnings per share for the six months ended 31 December 2018, including capital gains and losses, are expected to decrease by between 6,5% and 7,5% over the comparable period in the prior year, translating into a decrease from last year’s 326,2 cents to a range of between 302 and 305 cents per share. It is expected that AVI will release its results for the six months ended 31 December 2018 on or about 11 March 2019. Not good news for investors of AVI logging into their portfolios. Sure they will be as shocked as the market was with the trading update from AVI. 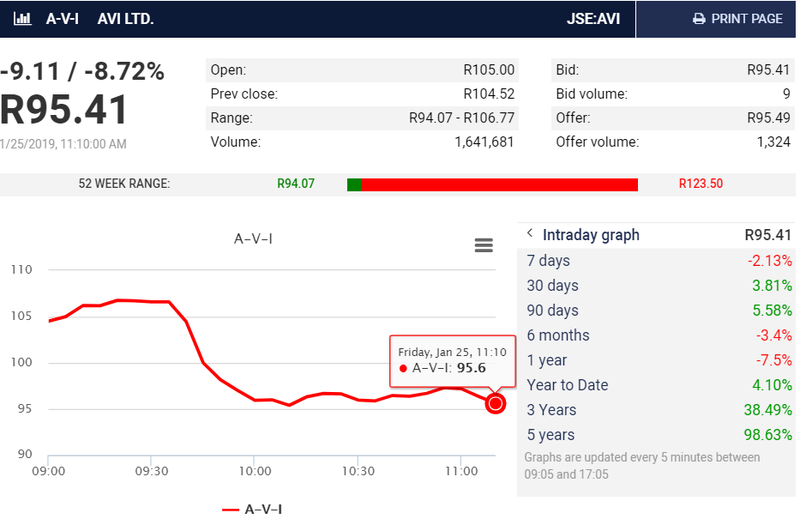 So the market has been disappointed by trading updates from Woolworths (WHL), Massmart (MSM), Shoprite (SHP), Mr Price (MRP), Vodacom (VOD), and now AVI (AVI). Clear sign that South African companies are feeling the tough South African economic conditions bite.